The harvest has already begun in Montreal! Over Labor Day weekend, Boyfriend and I scooted up to Canada for a few days. 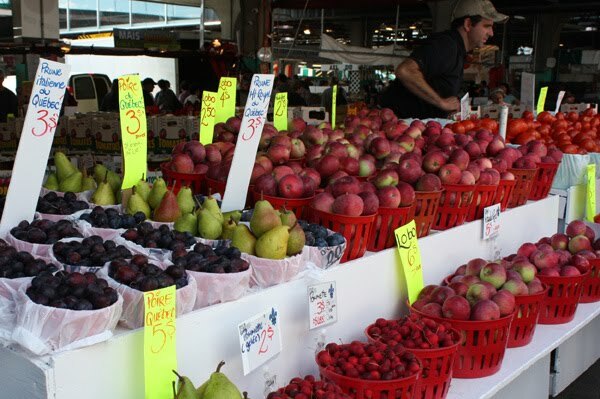 We spent a good chunk of our time at Jean-Talon Market, which is Montreal's largest farmer's market, and Atwater Market, located just a few steps north of the Canal de Lachine. 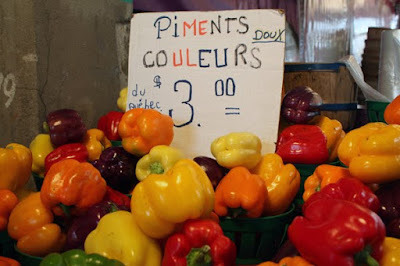 These pictures are all from Jean-Talon (except the last very one). One of the first signs that the harvest is beginning in North America: apples! I was surprised to find baskets and baskets of peppers drying in the sun in a place as far north as Montreal. 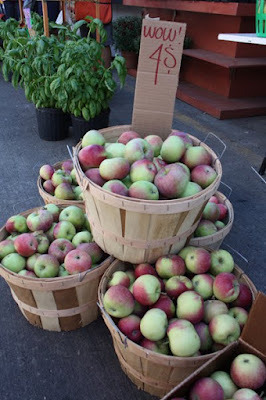 These were all out in the dry, cool, open air. My assumption was hot weather would be necessary, but I guess not. Boyfriend had never seen purple peppers before and wanted a photo of them. Gorgeous colors! Before this trip, if someone had told me that Canada had fruit that I had never seen before, I would have shook my head and said, "No way!" 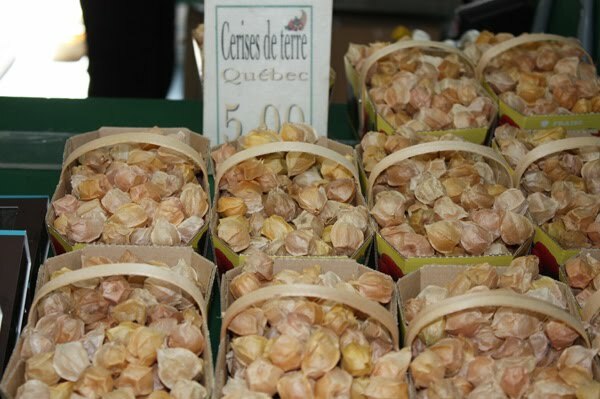 And yet, behold: ground cherries. 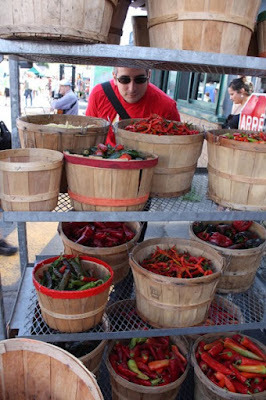 They have a tomatillo-like wrapper that protects a little yellowish-orange fruit, which tastes like a mild or slightly sour cherry with a tight skin that pops like the grape tomato. Ground cherries, or cerise de terre, are popular in pies and jams, apparently. 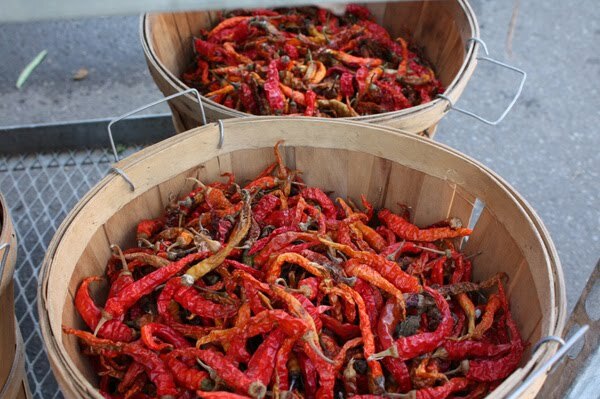 I tasted one or two raw. Not bad! 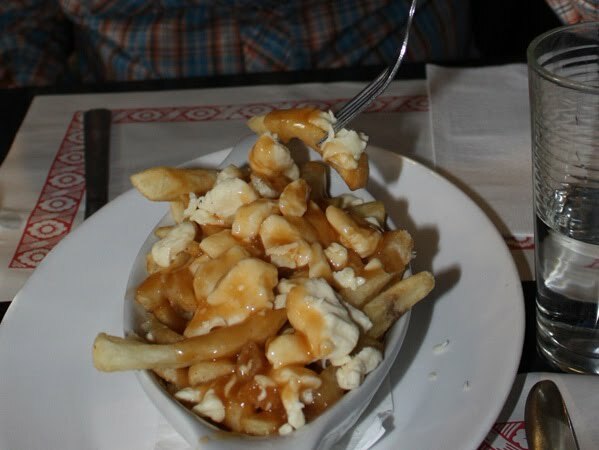 Bring up Montreal, and the one thing everyone really wants to talk about, food-wise, is poutine. I've had poutine before, but seeing as it was Boyfriend's first time not just in Montreal, but in the country of Canada itself, yes, we did eat share a dish of poutine. Voilà.